I have recently found that I quite enjoy swinging around an axe. Thursday morning I came into the studio and spent a couple hours chopping wood, a couple hours throwing, and many hours darting my thrown forms. I particularly enjoyed standing in the kiln pad, throwing around an axe and feeling the weight of the maul smash through a hard piece of tree. Physical activity has unfortunately taken the back seat in my day to day life. Apart from lugging clay around, I haven't had the need to exert physical energy in quite a long time. As a formerly athletic person, I have really quite missed the feeling of physical exertion. When I played rugby, there was a moment, just on cusp between "warm-up" and "game-play" where I no longer felt tired and spent, but rather like I could run a marathon and smile the whole way. 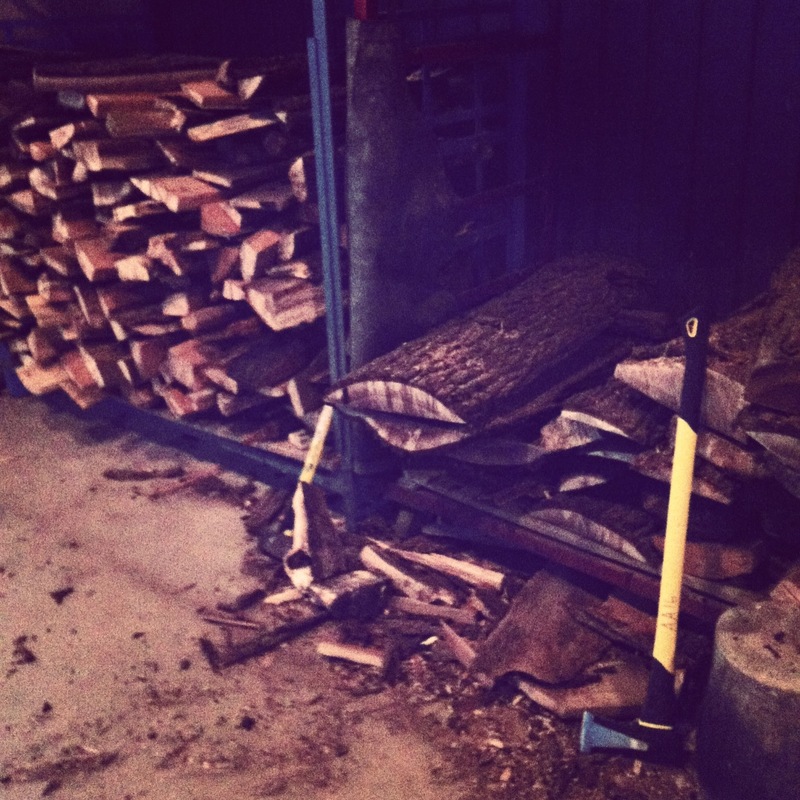 That feeling of delight filled my Thursday morning - splitting wood was probably the most enjoyable part of my day. Listening to David Bowie, sporting my Lou Reed shirt and hearing the crack of wood splitting in half made me feel like a real badass. I may have to start incorporating wood splitting into my daily routine. With the wood firing just over a week away, I'm in heavy preparation and production mode. With the help of my partner's lumberjack qualities, we have finished all of the wood chopping and I am now pumping out as many pots as I can in the time leading up to the firing. As of late, I have been primarily working on developing a cupcake stand form. I started with a variety of shapes that I had thrown and altered, and have been generating a size range for two forms that I felt were the most successful. The first stand is a voluminous pillow shape with a flat "cookie" on top and a textured foot ring. 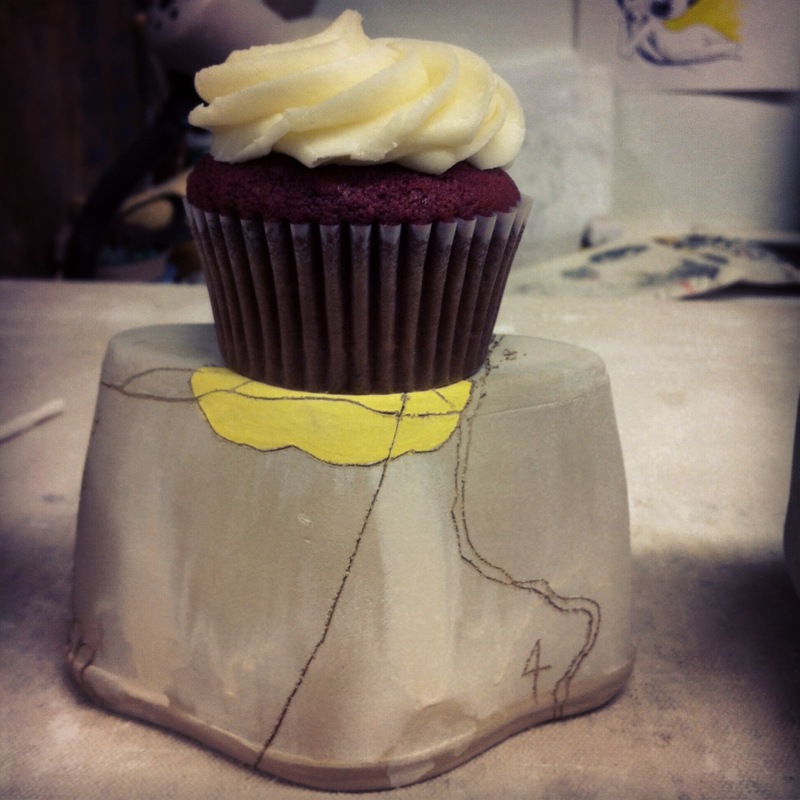 The second is a closed form that acts as a mountain or solid pedestal for the cupcake to sit on. I have been experimenting with the size, function and decoration of these two forms, designing stands and servers for single, couple and multiple cupcakes. I will be working this week on fusing tea service and cupcakes together. Part of my research for dessert serving involves visiting cupcake boutiques, sampling flavours and finding inspiration from the elegantly decorated treats. This week I made it to three different bakeries, purchased a treat and tested it out on my forms. Some of the boutiques even have cupcake stands that I can stare at and mentally dissect in their showroom. 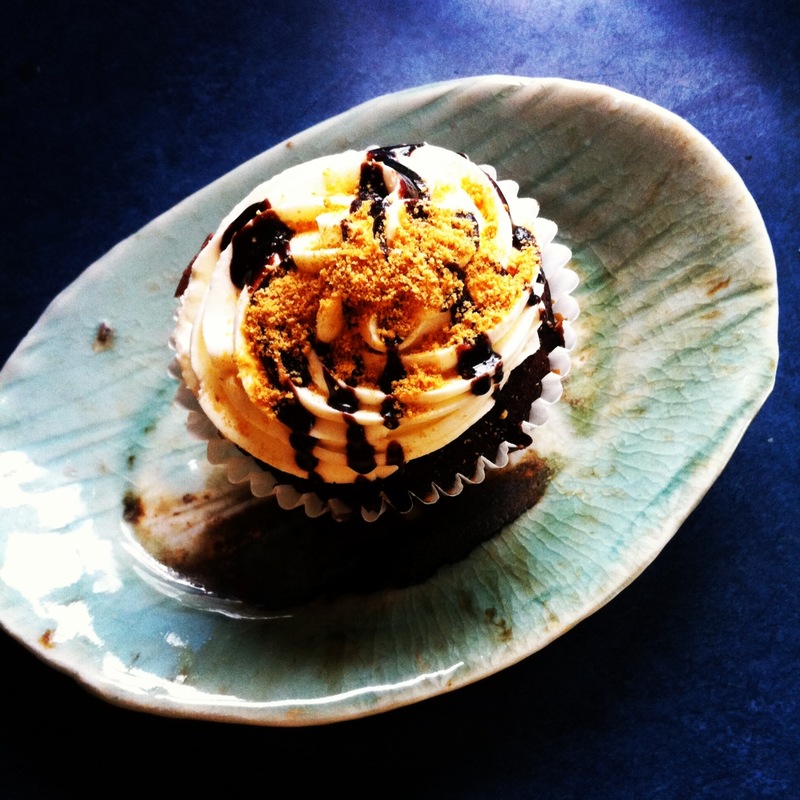 Yesterday I treated myself to a Chocolate Cheesecake cupcake from Beyond the Batter in Waterdown after visiting my hairdresser. I didn't go to the studio so instead used my porcelian dessert plate "Glacial" for the first time, and treated myself to a cupcake, earl grey and Battle Royale. I'm off to the studio now to decorate a few dozen stands and prepare for my critique with the famous ceramic artist Leopold L. Foulem. He will be coming to Sheridan tomorrow to give a talk on professional practice and critique the work of the ceramics students. His work is amazing, and as one of the most influential and well-known artists in the ceramic industry, I'm sure he will have many important and inspiring things to say.